Many consumers thought that the Adidas Ultra Boost X was suitably lightweight for daily use. The cushioning system was comfortable, noted several testers. The lightweight disposition of this shoe gained the favor of runners. A lot of those who have tried this shoe noted that it performed well on the roads. The design of this shoe was welcomed by many purchasers. The personalized coverage afforded by the unique arch design of this shoe received positive feedback. A runner wrote that although this running shoe was a bit pricey, it was worth the purchase because of what it offered. Those with small or narrow feet felt that it fits exactly as they expected. Some runners felt that the sizing scheme for the Adidas Ultra Boost X was off; some felt that it was ½ size smaller while others deemed that it was ½ size larger. This shoe felt a bit tight around the mid-foot section, commented several purchasers. The heel section of the upper felt rough, according to a tester; it caused some blistering to the back of her feet. According to a disconcerted user, this shoe had caused some stress fractures on her foot, as well as achy knees. The rubber in the outsole unit tended to rub off easily, some runners observed. Generally, the feedback for the Adidas Ultra Boost X was positive. Many runners enjoyed this running shoe’s performance on the roads. They also welcomed its cool design and its lightweight nature. Conversely, there were consumers who had concerns with some of its components, with some of them even complaining of injuries while wearing it. I’ll admit, it was the sale that sold me. I had been scrolling past these shoes for months attracted to the look, but not so impressed by the price tag. When the box arrived, I was giddy with excitement to try them, only to find my standard size was a ½ size too small. When the new pair of the Adidas Ultra Boost X arrived, I crossed my fingers and hoped it was worth the wait. The midsole boost dominates the look. The shoe appears to be floating on a foam cloud. The upper is continuous knit. The plastic heel counter and eye laces are the only pieces added to the top’s knit body. There is no tongue and has a sock-like feel when you slip them on. Adidas has many colors to choose from. When I took them out of the box, both of my teenagers "oohed and ahhed " at the appearance. That says something, right? The first thing I noticed was the roomy toe box. My feet are a little on the wide side, and my toes had plenty of wiggle room in these shoes. The knit exterior seemed to hug my foot and conform to my movements. In contrast, the midfoot was snug. My arch felt supported, and the midfoot area felt secure if not squeezed at times. In this design, the upper is not attached to the midsole at the instep, so I was surprised at how tight this felt when I first tried them on. The heel was comfortable and did not slip. It also has interior padding that adds to the comfort. Due to the no tongue design, the collar was higher than other shoes, and I had to be sure to wear higher socks to avoid rubbing. This, again, created a slipper or sock-like feel to the shoe. The midsole boost lived up the the the hype and put a little extra bounce in my step as I was walking around the living room. The boost cushioning has a springy feel and helps you feel light on your feet during longer runs. The shoe is lightweight, and the seamless upper is breathable and comfortable. My knees did not have any complaints after longer runs, and I felt supported by both the cushioning and the knit upper that hugged my feet. The thin outer sole has good traction that protects your feet but is still flexible and allows you to feel the road as you run. The only area of the shoe that took some getting used to was the tighter midfoot and arch area. In the beginning, I felt supported, but after five miles or so, I began to feel an ache in the arch of my foot. The contrast of the tight midfoot and the roomy toe box took some getting used to. It seemed opposite to most running shoes I’ve worn where the toe box and heel feel snugger than the middle of the shoe. The first few runs my foot cramped up. These have been my daily runners for over 100 miles now, and the shoe has held up fantastically. I still feel the cushioning of the midsole and the snug fit of the upper. My foot has gotten used to the midfoot and does not cramp as it did a month ago. If I am planning on a long run of 7+ miles, however, I usually grab a different pair of shoes to avoid aches and pains in my midfoot. It is the best shoe that Adidas has ever brought out specifically for women! Overall, I really really enjoyed this shoe. Before this, I went in (kind of) thinking like nothing can beat the Ultra Boost I'm in love with. As always, I love the tread and rebound of the Ultra Boost X – they are so bouncy, with thousands of ‘energy capsules’ within the midsole that redirect energy back into your step, and a sole that is made from the same material as Continental tyres – guaranteed to take you through many miles on the roads before wearing down. The Adidas Ultra Boost X is a running shoe that’s specifically designed for women. Its purpose is to move in accordance with the natural movement of the foot as it goes through the gait cycle. It even encompasses the majority of the shape of the foot via a specially designed upper that allows the fabric to wrap around the mid-foot section. Visually, this shoe melds the design trends of running shoes and casual footwear. It has a cool look that’s not too striking, yet its different colorways allow the wearer to be more versatile when it comes to the aesthetics of their shoes. A knitted upper evokes the feeling of wearing a sock in lieu of actually wearing a sock. One of the prime technologies of the Adidas brand is the boost™. Made up of compacted TPU pellets, this full-length foam offers responsive cushioning to the foot of the wearer. The outsole makes use of a rubber compound that is durable and efficient at delivering traction over the surfaces. The Adidas Ultra Boost X has a standard running shoe length. It comes in sizes that follow the regular measurements. The available width for the men and women’s versions is medium. It welcomes the runners who have medium sized feet. Its semi-curved shape naturally accommodates the form of the foot. The rubber that is used for the outsole unit of the Adidas Ultra Boost X is from Continental™. It’s a high-quality material that protects the rest of the sole unit from the abrasive nature of the roads. It also grips surfaces well, even wet ones. The STRETCHWEB design of the outsole allows the platform to be more flexible. The foot is then granted the opportunity to move more naturally as it transitions through the gait cycle. The midsole unit of the Adidas Ultra Boost X features the boost™ cushioning system, which is also the same as the technology found in the Ultra Boost running shoe. This full-length foam is made from thousands of TPU pellets that have been amalgamated into a single unit. It provides responsive cushioning throughout the gait cycle while also ensuring comfort, even when standing idly. The TORSION® SYSTEM is a unit that holds the mid-foot in place and prevents it from wobbling as the runner performs. It is placed in the middle of the platform. 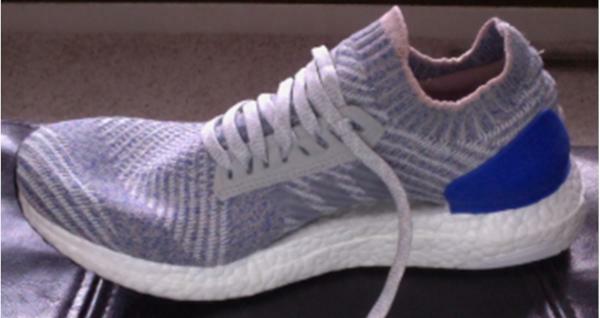 The fabric that’s used for the upper unit is called the Primeknit. This material is similar to woven cloth, so it delivers the feeling of actually wearing socks. It’s also able to accommodate natural airflow into the foot-chamber, thus delivering a cool and dry interior environment. The mid-foot section of the upper features a Dynamic Arch design. It basically causes the upper unit to wrap around the arch, supporting it along with the whole top section of the foot. This unique design also elevates the look of the shoe.